Classes, workshops and demos are offered throughout the year in our gallery. To register, complete the downloadable Registration Form and return it with your payment or call 904.824.2310 to sign up by phone. Take your painting skills to the next level! 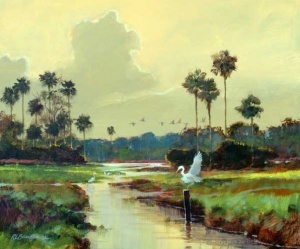 Master artist Roger Bansemer, co-host of the popular PBS series, “Painting & Travel,” will lead you through the process of orchestrating a successful painting from start to finish. Through demos, step-by-step painting exercises and individualized instruction, Roger shares expertise on compositional design, use of color to create harmony and drama, perspective basics, brushwork techniques and finishing details that bring the painting to life. Students will work from photographic reference using acrylics or oil. You’ll also have the opportunity to visit Roger’s studio, located in historic St. Augustine. For both beginner and seasoned artists. Registration: $425 ($10 discount for STAAA members) includes lunch both days; A supply list will be provided upon registration. Call (904) 824-2310 to enroll. Figure Drawing Sessions – Weekly on Monday nights at 6pm live model sessions. Gestures and long poses. A non-instructional intensive weekly studio session with the live model. Gestures, short and long poses offer a focused environment for studying the human form. Participants may work in any medium. Easels, tables and chairs provided. StAAA Members: $10 model fee. Call for more information. Open Studio Tuesdays – Weekly 1-4pm Lacking studio space? Looking for a workplace to create, critique or collaborate? Tuesday afternoons have been set aside for art making in the gallery. Easels, tables and chairs provided. Fee: $5/StAAA members. Call (904) 824-2310 for information or to sign up.